For other uses, see Hormel (disambiguation). Hormel Foods Corporation is an American food products company founded 1891 in Austin, Minnesota, by George A. Hormel as George A. Hormel & Company. Originally focusing on the packaging and selling of ham, , sausage and other pork, chicken, beef and lamb products to consumers; by the 1980s, Hormel began offering a wider range of packaged and refrigerated food brands. The company changed its name to Hormel Foods in 1993. Hormel serves 80 countries with brands such as Applegate, Columbus Craft Meats, Dinty Moore, Jennie-O and Skippy. The company was founded as George A. Hormel & Company in Austin by George A. Hormel in 1891. It changed its name to Hormel Foods in 1993. The building in which George A. Hormel started his business. Preserved at the Mower County Fairgrounds in Austin. The Hormel obelisk in Austin's Oakwood Cemetery. George A. Hormel (born 1860 in Buffalo, New York) worked in a Chicago slaughterhouse before becoming a traveling wool and hide buyer. His travels took him to Austin and he decided to settle there, borrow $500, and open a meat business. Hormel handled the production side of the business and his partner, Albert Friedrich, handled the retail side. Their partnership dissolved in 1891 as Hormel started his own meat packing operation in northeast Austin in a creamery building on the Cedar River. To make ends meet in those early days, Hormel continued to trade in hides, eggs, wool, and poultry. The name Dairy Brand was first used in 1903.:68 In the first decade of the 20th century distribution centers were opened in St. Paul, Minneapolis, Duluth, San Antonio, Dallas, Chicago, Atlanta, and Birmingham. In 1915 Hormel began selling dry sausages under the names of Cedar Cervelat, Holsteiner and Noxall Salami. :79 Hormel products began appearing in national magazines such as Good Housekeeping as early as 1916. Hormel Chili and Spam were introduced in 1936 and 1937 respectively. In 1938, Jay C. Hormel introduced the "Joint Savings Plan" which allowed employees to share in the proceeds of the company. In 1933, workers, led by itinerant butcher Frank Ellis, formed the Independent Union of All Workers and conducted one of the nation's first successful sit-down strikes; the union would later join the Congress of Industrial Organizations (CIO, later AFL-CIO). Little Sizzlers sausages were introduced in 1961 and Cure 81 hams were introduced in 1963. Not-So-Sloppy-Joe Sloppy Joe sauce made its debut in 1985. In 1986, Hormel Foods acquired Jennie-O Foods and also began an exclusive licensing arrangement to produce Chi-Chi's brand products. The following year, Hormel Foods introduced the Top Shelf line of microwavable non-frozen products. The company added to their poultry offerings by purchasing Chicken by George, created by former Miss America Phyllis George, in 1988. That same year, Hormel Foods also introduced microwave bacon. In 1984 Hormel introduced the Frank 'n Stuff brand of stuffed hot dogs. In August 1985, Hormel workers went on strike at the Hormel headquarters in Austin, Minnesota. In the early 1980s, recession impacted several meatpacking companies, decreasing demand and increasing competition which led smaller and less-efficient companies to go out of business. In an effort to keep plants from closing, many instituted wage cuts. Wilson Food Company declared bankruptcy in 1983, allowing them to cut wages from $10.69 to $6.50 and significantly reduce benefits. Hormel Foods had avoided such drastic action, but by 1985, pressure to stay competitive remained. Workers had already labored under a wage freeze and dangerous working conditions, leading to many cases of repetitive strain injury. When management demanded a 23% wage cut from the workers they decided to begin the strike. It became one of the longest strikes of the 1980s. The local chapter of the United Food and Commercial Workers Union, Local P-9, led the strike, but was not supported by their parent union. The strike gained national attention and led to a widely publicized boycott of Hormel products. The strike ended in June 1986, after lasting 10 months. The SPAM Museum in Austin, Minnesota, was opened in 2001. That same year, Hormel Foods acquired The Turkey Store, the business was combined with Jennie-O Foods to form Jennie-O Turkey Store. According to Triple Pundit, Hormel Foods began CSR reporting in 2006. The company has been included in Corporate Responsibility magazine's list of the "100 best corporate citizens" for 10 consecutive years. In 2008 an article in the New York Times, "SPAM Turns Serious and Hormel Turns Out More," detailed an overwhelming spike in the demand for SPAM, perhaps due to the flagging economy. In 2009 Hormel and Herdez del Fuerte created the joint venture MegaMex Foods to market and distribute Mexican food in the United States. Brands included in the venture include Herdez, La Victoria, Chi Chi's, El Torito, Embasa, Wholly Guacamole, Del Fuerte, Dona Maria, Bufalo, and Don Miguel. In September 2008, animal rights organization PETA released a video recorded over the course of 3 months showing workers at a pig factory farm in Iowa abusing pigs. The factory farm was owned by Natural Pork Production II LLP of Iowa until August 18, 2008, at which point ownership had transferred to MowMar LLP. Hormel spokeswoman Julie Henderson Craven, who responded to the PETA video, called the videotaped abuses "completely unacceptable." In their 2007 Corporate Responsibility Report, Hormel Foods stated that all suppliers are expected to comply with several welfare programs to ensure that the hogs purchased are treated humanely. Because of the investigation, several employees of the farm were fired and six individuals faced charges due to the abuse. In 2011, Hormel Foods announced a 2 for 1 stock split. In 2013, Hormel Foods purchased Skippy—the best-selling brand of peanut butter in China and the second-best-selling brand in the world—from Unilever for $700 million; the sale included Skippy's USA and China factories. In May 2015, Hormel revealed it would acquire meat processing firm Applegate Farms for around $775 million, expanding its range of meat products. In 2015, the Hormel Health Labs division of Hormel Foods launched its Hormel Vital Cuisine line of packaged ready to eat meals, nutrition shakes and whey protein powders geared towards cancer patients and made available for home delivery. The line was developed in concert with three parties, as "Hormel brought food formulation, packaging and shelf stability knowledge, (chef de cuisine) Ron DeSantis brought taste and texture expertise, and the Cancer Nutrition Consortium offered the nutritional framework." In 2015, SPAMMY became available for purchase under Title I for U.S. Department of Agriculture (USDA) feeding programs and Title II for U.S. Agency for International Development (USAID) programs under the name fortified poultry-based spread (FPBS). Four years earlier, the company had made an initial three-year commitment to deliver 1 million cans of this product to in-need families in Guatemala. Also in 2015, after an undercover investigation by a group known as Compassion Over Killing at an Austin, Minnesota processing plant, Hormel Foods announced it was "bringing humane handling officers to a Quality Pork Processors Incorporated facility to ensure compliance with its own animal welfare standards." It has also told QPP to provide extra training, enhance compliance oversight and increase third-party auditing. According to Reuters, "in one scene of the video, pigs covered in feces or pus-filled abscesses are sent down the plant’s conveyor belt. At one point, a knife is used to cut open abscesses on dead pigs." In 2016, Peak Rock Capital purchased the Diamond Crystal Brands Inc. unit, purchased by Hormel in 2002 for $155 million from Imperial Sugar. In 2016, 2017 and 2018, the company was named to the Human Rights Campaign's Best Places to Work for LGBT equality. In 2017, Hormel sold Clougherty Packing, owner of the Farmer John and Saag's brands, to Smithfield Foods. In October 2017, Hormel announced it would acquire deli meat company Columbus Manufacturing for $850 million. In 2017, Mercy For Animals released undercover video footage of pigs being abused at The Maschhoffs LLC., a Hormel pork supplier in Hinton, Oklahoma, with piglets having their testicles ripped out and tails cut off without any anesthetic, piglets left to suffer from untreated illness or injuries, and mother pigs crammed into gestation crates unable to move. In response, Hormel temporarily suspended its buying from the supplier. According to the Military Times, the company has been listed in the Best for Vets Employers Top 100 consecutively since 2013. ^ a b Hughlett, Mike (November 24, 2015). "Hormel's profit growth exceeds expectations, optimistic targets set for 2016". Star Tribune. ^ "Hormel Earnings Release" (PDF). Hormel Foods. Retrieved December 18, 2018. Cash on hand increased to $459 million from $444 million at the beginning of the year. ^ a b c "Hormel Foods Corporation - Form 10Q: Consolidated Statements of Financial Position". www.sec.gov. Securities and Exchange Commission. April 29, 2018. ^ "Hormel Company Financials". NASDAQ. Retrieved December 18, 2018. ^ "George Hormel, 85, Packing Firm Founder, Dies". Chicago Tribune. June 5, 1946. ^ "Friedrich & Hormel are Dissolved". Mower Country Transcript. October 7, 1891. ^ Doocy, Sue. "Mower County Historical Society Main Location". Mower County Historical Society. MCHS. Retrieved July 20, 2018. ^ Garrison, Webb (1998). A Treasury Of Minnesottales: Unusual, Interesting, And Little-Known Stories Of Minnesota. Thomas Nelson, Recorded Books Inc. p. 73. ISBN 9781418530624. ^ a b c d Dougherty, Richard (1966). In Quest of Quality: Hormel's First 75 Years. Austin, Minnesota: Geo A. Hormel & Company. ASIN B0006BOWUW. OCLC 988269. ^ "Hormel Good cheer ad". Good Housekeeping. New York: International Magazine Company. July 1916. Retrieved August 27, 2018. ^ a b c Levinson, Frances (March 11, 1946). "Hormel: The Spam Man". Life. New York: Time Inc. p. 64. ^ a b c d e Lund, Doniver (1990). 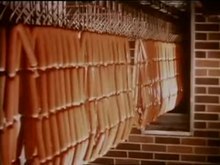 The Hormel Legacy: 100 Years of Quality. Austin, Minnesota: Geo A. Hormel & Co. ASIN B0006EVC7K. OCLC 23458845. ^ Breining, Greg; Chesley, Paul (2006). Minnesota. Compass American Guides. p. 123. ISBN 1400014840. ^ Allen, Gary J; Albala, Ken, eds. (October 30, 2007). The Business of Food: Encyclopedia of the Food and Drink Industries. Santa Barbara: Greenwood Press. p. 225. ISBN 031333725X. ^ Almiron, Núria; Cole, Matthew Daniel; Freeman, Carrie P (2016). Critical Animal and Media Studies Communication for Nonhuman Animal Advocacy. ISBN 9781138842267. ^ a b Moore, Hank (April 5, 2016). Pop Icons and Business Legends: History of Commerce and Heritage of Culture. New York: Morgan James Publishing. p. 124. ISBN 1630478431. ^ "Joint Earnings Plan Tried Out In Meat Plant". Minneapolis Star. January 6, 1939. ^ "Ellis, Frank Alexander, 1888 - 1976 Oral History Interview, November 1974 – Southern Minnesota Historical Center – Physical Collections – Library Services – Minnesota State University, Mankato". lib.mnsu.edu. ^ Ken, Gagala, (1985). "A Wobbly-Bred Campaign in Minnesota - Minnesota Public Radio (rebroadcast from 7 August 1997)". Labor Research Review. ^ ""The Strike is On" on Midday". Minnesota Public Radio. 1985. ^ Holcombe, Randall G. (April 17, 2018). "Writing Off Ideas: Taxation, Philanthropy and America's Non-profit Foundations". Routledge. ^ "Hormel Wins Approval of Humane Practices". Honolulu Advertiser. April 17, 1959. p. 9. ^ a b Reuters News Agency (January 24, 2001). "Hormel Foods is Planning to Buy The Turkey Store". The New York Times. Reuters. Retrieved July 14, 2018. ^ Lazarus, George. "Hormel Joins Forces With Mexican Salsa Maker". Chicago Tribune. Chicago Tribune. Retrieved September 28, 2015. ^ a b Press, From Associated (December 7, 1992). "Hormel Prospers by Getting Into Processed Food Lines : Keyword: Its profit has tripled since 1980, as it has reduced its emphasis on fresh meat products". Los Angeles Times. ^ Puzo, Daniel (June 2, 1988). "Product-Introduction Rate Decline Reported After Marketing Setbacks". LA Times.com. Retrieved October 25, 2018. ^ Hage, Dave; Klauda, Paul (1989). No retreat, no surrender: labor's war at Hormel. W. Morrow. ISBN 0688077455. ^ Rachleff, Peter. "They Say Give Back, We Say Fight Back". DollarsandSense.org. Retrieved January 3, 2013. ^ Baskas, Harriet (March 27, 2016). "Spam, the Edible Kind, Could Be a Boon for This Minnesota Town". NBC News. ^ Franco, Nick (May 22, 2012). "CSR Reporting's Greatest Hits in the Twin Cities". Triple Pundit. ^ "CRO's 100 Best Corporate Citizens 2009" (PDF). Corporate Responsibility Magazine. 3BL Media. p. 2. ^ Martin, Andrew (November 14, 2008). "Spam Turns Serious and Hormel Turns Out More". The New York Times. ^ "Hormel, Herdez Del Fuerte Launch MegaMex Foods". PreparedFoods.com. July 6, 2009. Retrieved January 3, 2013. ^ Selcke, Taylor (February 1, 2012). "Hormel's MegaMex Foods sales up 150 percent". www.bizjournals.com (Press release). Minneapolis/St.Paul Business Journal. ^ "Mother Pigs and Piglets Abused by Hormel Supplier". People for the Ethical Treatment of Animals. n.d.
^ "Graphic Abuse Of Pigs Caught On Tape". CBS News. Associated Press. September 17, 2008. Archived from the original on November 28, 2018. ^ "Video shows workers abusing pigs at Hormel supplier". The Austin Daily Herald. September 16, 2008. Retrieved January 3, 2013. ^ Lorentzen, Amy (October 24, 2008). "Charges filed against 6 in Iowa pig abuse case". USA Today. ^ Isidore, Chris (January 3, 2013). "Spam maker buys Skippy peanut butter". CNN Money. CNN. Retrieved January 3, 2013. ^ Editorial, Reuters (May 25, 2015). "Hormel Foods to buy organic meat company Applegate for $775 million". Reuters. ^ Painter, Kristen Leigh (November 28, 2016). "Hormel joins cancer specialists to develop line of ready-made foods for chemo patients". Chicago Tribune. tronc, Inc.
^ Thurow, Roger (2016). The First 1,000 Days: A Crucial Time for Mothers and ChildrenÑAnd the World. PublicAffairs. p. 187. ISBN 9781610395854. ^ "Hormel Foods Develops Innovative Protein Product to Address Childhood Malnutrition". Hormel Foods (Press release). March 30, 2011. ^ a b c Na, Danny (November 12, 2015). "U.S. supplier to Hormel tightens controls after animal abuse video". Reuters. Thomson Reuters. Retrieved November 19, 2015. ^ Hughlett, Mike (November 11, 2015). "USDA investigating Hormel supplier's treatment of pigs after video surfaces". Star Tribune. ^ Mayle, Mary Carr (April 28, 2016). "Diamond Crystal Brands changing hands". businessinsavannah.com. Retrieved June 15, 2017. ^ Hughlett, Mike (April 29, 2016). "Hormel sells Diamond Crystal Brands to private equity firm in Texas". Star Tribune. Retrieved June 15, 2017. ^ "Smithfield Foods finalizes acquisition of Clougherty Packing from Hormel Foods". Food Business News. January 4, 2017. Retrieved October 5, 2017. ^ Trotter, Greg. "Spam-maker Hormel to buy premium deli meat company Columbus for $850 million". chicagotribune.com. Retrieved October 31, 2017. ^ a b Tom Meersman and Kristen Leigh Painter (January 31, 2017). "Animal rights group accuses Hormel supplier of mistreating pigs". Star Tribune. Retrieved January 31, 2017. ^ "Corey Resigns; Gray Board Chairman and Thompson President". Austin Daily Herald. 74 (213). Austin, Minnesota. July 20, 1965. ^ Coss, Kevin (April 12, 2012). "Former Hormel CEO Holton dies at 92". Austin Daily Herald. ^ S&P Global Market Intelligence. "Executive Profile: Richard Lyle Knowlton" (Employee Information Portal provided by Bloomberg.com). Healthcare Providers and Services Company Overview of Eisenhower Medical Center, Inc. Bloomberg. Retrieved July 13, 2018. Beyma, Richard L. Knowlton with Ron (2010). Points of difference transforming Hormel (1st ed.). Garden City, NY: Morgan James Pub. ISBN 9781614481126.
Cooper, Jake (1988). Lessons of the P-9 strike. San Francisco, CA: Socialist Action. Genoways, Ted (2014). The chain: farm, factory, and the fate of our food. ISBN 9780062288752. White, John H. (1986). The great yellow fleet : a history of American railroad refrigerator cars. San Marino, Calif.: Golden West Books. ISBN 9780870950919. Wikimedia Commons has media related to Hormel Foods. St. Louis Refrigerator Car Co.